I too am new to Acupuncture I have terrible migraines and someone suggested I try acupuncture to help with them I have had one migraine since June 2008 that won’t go away. It will ease off a bit but never go completely away. I’ve been on tons of medications and have been monitored by neurologists. I’ve gone to Chris about five times now and I’m already beginning to feel better! I feel the best I have in nearly a year! The office is nice and relaxing and Chris listens to your problems. He is very professional. I feel with a few more visits, I can definitely be back to my normal once-a-month migraine self! Great place! 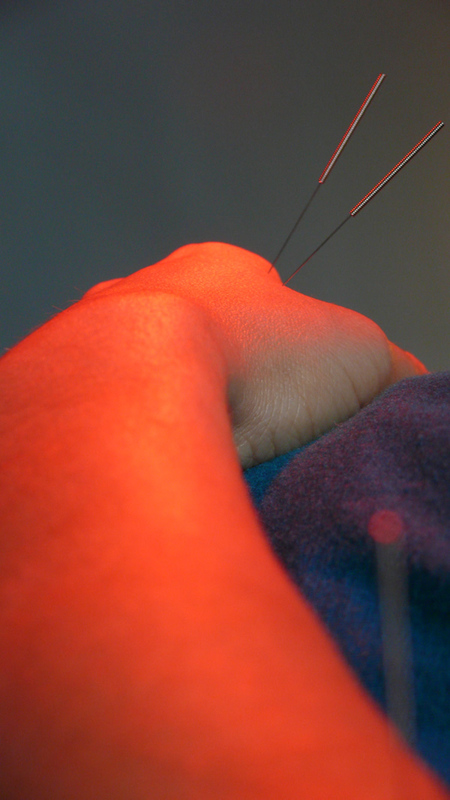 As a regular user of alternative medicine that includes chiropractic, homeopathy and energy work, I found myself drawn to acupuncture as another option that might further alleviate my diagnosed carpal tunnel and other muscle and joint pain issues. My Chiropractor recommended Chris O’Donnell highlighting his knowledge of both eastern and western medicine. My health issues are complex, but my consultations with Chris, his knowledge of the body and his treatment protocol have been extremely beneficial to me and have resulted in both temporary and more permanent improvement of my symptoms. I foresee continuing to use Chris and his practice regularly as a viable treatment alternative. I came to Chris after many months of physical therapy that left me unable to fully recover from inflammation and tightness in my hip and hamstring originating from a bike crash. From my very first acupuncture treatment I experienced a marked improvement. Along with a continued rehab regime, Chris helped me to break through a number of barriers on the illusive road to recovery. I highly recommend acupuncture and Chris’ care. I wanted to thank you for all the appointments we had together. They did help my shoulder pain a lot. I had a severely pinched nerve that required neck surgery. The core pain is already better, and the numbness is reduced. It will take about 3 months for the nerves to fully restore, and I have to be careful for a few months about what I lift, etc. But it’s all on the mend. After that, I look forward to exploring acupuncture again. Following a 2007 bike accident, I had significant pain in the lower back/hip area. After reaching a plateau with physical therapy, my doctor suggested I try acupuncture. After a few weeks of visit to Chris, my back began to loosen up and I started running again. With Chris’s help, I was able to compete in Ironman Coeur d’Alene in 2008, and look forward to many years of triathlon competition. I found Chris O’Donnell after I an accident I had. I chose him due to the fact that he focused on sports related injuries also. One of my focuses was to rebuild the strength in my shoulder. Following my accident, I was unable to do a push up. In combination of Chris’s treatments and a personal trainer, we rebuilt the muscle up and was able to do 25-30 without even considering my shoulder. It was a great feeling to see the results. I would recommend Chris. Due to chronic inflammation issues (knees, feet, etc); I decided to seek out alternative methods to help manage the inflammation and discovered acupuncture. Acupuncture has definitely improved my life. My treatment experience was excellent. My body responds well to acupuncture, so it usually just takes one session to eliminate the pain I’m experiencing, especially the patella inflammation I experience. Acupuncture has given me new treatment options other than drugs or surgery. I am always looking for alternative methods to compliment Western treatments. I would recommend acupuncture to a friend. Overall, acupuncture treatments have helped me minimize chronic inflammatory symptoms by calming down the affected area. In return, this has allowed me to exercise more readily and live a pain free life. Over the past 5 years, I have sought acupuncture treatments for a variety of ailments (hip/back problems and shoulder/arm pain among others.) In every case I was extremely pleased with the results as I was anxious to avoid surgery and dependency on drugs. Chris O’Donnell is a very talented and caring professional. I knew he was as interested in my recovery as I was, and the quality of my life was greatly improved. I would recommend Chris and Acupuncture Professionals to anyone. Wonderful! I’ve had terrible migraines for a long time and had one migraine that had not eased off since last June. Chris listens to your problems and determines how placement of the needs would be best. He is very nice and professional as well. He gives me hope for improvement and I have nothing but good to say about Chris. He is willing to go directly to the problem with the placement of the needles. He has a quiet manner, professional, and doesn’t waste time. He does not make me wait. His office is comfortable and very clean. He has a bathroom right in his office. My visit with Chris O’Donnell at Acupuncture Professionals, Inc. was very good. I felt that Chris gave off a sense of ease to allow you to relax and be comfortable. Esp. important when you come in with pain/trauma. I just want to thank Chris for helping heal my tennis elbow. I had tried almost everything and had just about given up that it would get better. Chris’ acupuncture was able to take my pain away and help me heal completely. Thanks again! “Chris is wonderful and has cured me of so many things!! I went to Chris O’Donnell at Acupuncture Professionals and had never had Acupuncture before. Chris was so great! He took a thorough history and asked tons of questions a Western doctor would never ask, like what my menses and stool was like. He answered all my questions with patience and kindness. Chris has treated me for TMJ, colds, allergies, back pain, and period irregularity over the last year and a half and in all cases, I got better. I’m a total convert and Chris has a lot to do with it. He really cared about my pain and approached my treatment holistically using acupuncture, herbs, and Tui Na, which to an unschooled person like me, seems like a combination of chiropractic and massage. Acupuncture and Tui Na have really alleviated my lower back pain and TMJ. Chris’ holistic approach is great; he worked in Western medicine before going into Eastern so he knows a lot about the body, treatments, and prescriptions form both sides; he has worked with my western doctors on my treatments, so I was supported by both medical systems. The office is conveniently located in SOMA and is a nice oasis, with comfy chairs, magazines, and delicious tea. Everyone there is super nice.